Which Blockbuster Movie Just Passed The Bechdel Test? Insurgent! The female cast of ‘Insurgent’, the second installment in the ‘Divergent’ trilogy based on the books by Veronica Roth, reads like a who’s who of Hollywood: Shailene Woodley, Kate Winslet, Naomi Watts, Ashley Judd, and Octavia Spencer to name just a few. The highly anticipated sequel to the first movie is already making waves, but we are interested in one aspect in particular, how the movie is breaking the stereotypical mold of female action heroes. ABC news reports that this film is setting new standards of how women are portrayed in the genre, because they are multi-faceted. One of the coolest things about ‘Insurgent’ is that it is a huge blockbuster movie that actually passes the Bechdel test. “What’s that?” you may be saying? (1) Does the film have at least 2 female characters in it? (2) Do those female characters talk to each other? (3) Do they talk to each other about something other than a man? While it is not an official regulation in the film industry, more and more people are starting to adopt the concept and talk about it in relation to Hollywood. It is a good thing! “When women lead up action-driven films and franchises, it’s usually one exceptional gal against the world. Here, they’re all over the place, serving as leaders, radicals and rebels, each wildly diverse, complicated, charismatic and flawed in their own unique way,” writes Lindsey Bahr for ABC news in an article titled ‘The Rebellious Women of Insurgent’. Much of the strong female representations in the story is credited to the author Veronica Roth who said this was something she did on purpose. “It was very intentional for me that most of the leaders in Tris’s world would be women, and not necessarily the good guys all the time. I think it’s equally important to have female villains. When people notice that there’s not a lot of representation in a particular area they try to make those characters holy symbols that are pure and good. That does a disservice to women,” she said. Naomi Watts was cast as Evelyn, Four’s estranged mom who lives as the leader of the Factionless and is considered a revolutionary anti-hero. When you look at traditional depictions of revolutionaries on screen you see tough, macho-type characters with a hard shell for an exterior, meaning there isn’t a lot of room for an emotional range. But the film’s producer Lucy Fisher said casting Naomi was an interesting choice because it allowed them to portray a different kind of hero. Shailene Woodley plays Tris, the hero of the story, who says she was drawn to the character because of how Tris deviates from the standard heroes we are used to seeing in fiction, aka the heroes who have it all together. While Shailene continues to insist she is not a feminist and doesn’t like the label, we can’t fault her for being drawn to characters that widen the scope of how audiences view young women on-screen. Perhaps, like Salma Hayek, she will eventually come around to not being afraid of identifying as a feminist, coz she sure lives like one! Well she’s right in the sense that we DO want to get to place in the movie industry and in the world where we don’t have to point out strong or diverse and complex representations of women because it is just a normal thing, but in order to get there we need awareness. 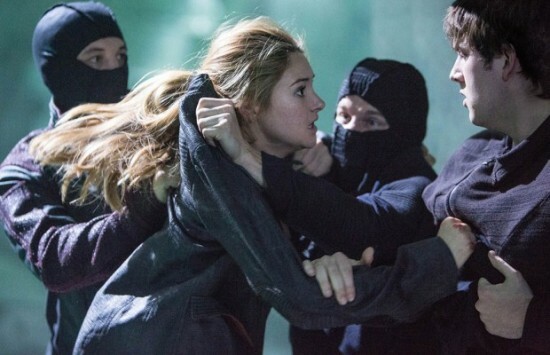 However, we do care that it is a female-driven storyline in ‘Insurgent’ because we are starting to see a breakthrough in the way women aren’t being boxed in by narrow characterizations. Perhaps that is in large part to a female writing the story in the first place, which is another reason we need more female writers. Regardless, we’re not here to debate Shailene Woodley’s feminism (or lackthereof). We believe in women having the right to choose and evolve without pressure from society and the media. In the meantime we are singing the praises of ‘Insurgent’ and how it will have a huge impact on the way millions of audience members worldwide will have permission to see women are flawed, complex, capable and interesting as men on screen.